Shake Out, Break Down or Bounce? The entire 2018 is basically a year most investors want to forget. The SPX is practically unchanged, down some 2% from the opening prints in January 2018. Seen over the year there is no real trend and the 200-day average is trading flat here. What has caused the great carnage among hedge funds and other investors is that recent volatility managed catching the crowd totally off guard. With a few sessions left before this year ends, the SPX sits at huge support levels. We have seen the index dip below the massive 2600 level on a few occasions this year, but every dip was quickly reversed. There is a longer-term trend around these levels as well. Bullish or bearish, but SPX sits at HUGE make or break levels. Given how the market has frustrated most, why not a final shake out, a dip below the 2600 area, only to see the market reverse higher again? NASDAQ is closing in on huge levels as well. 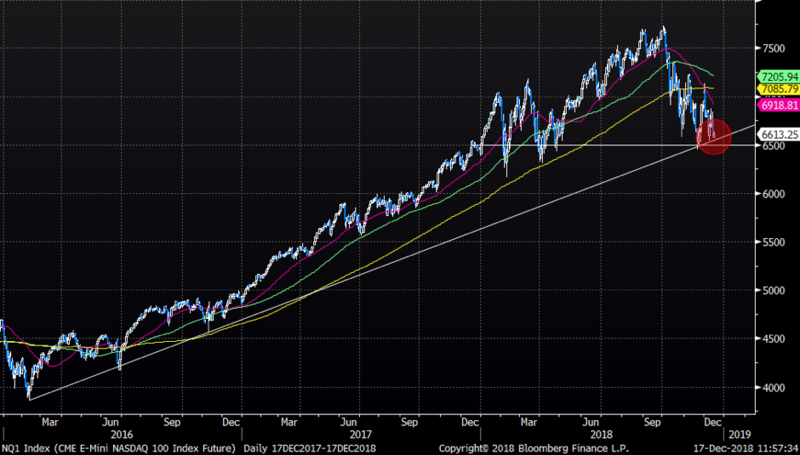 6500 is the big level to watch in NASDAQ futures. 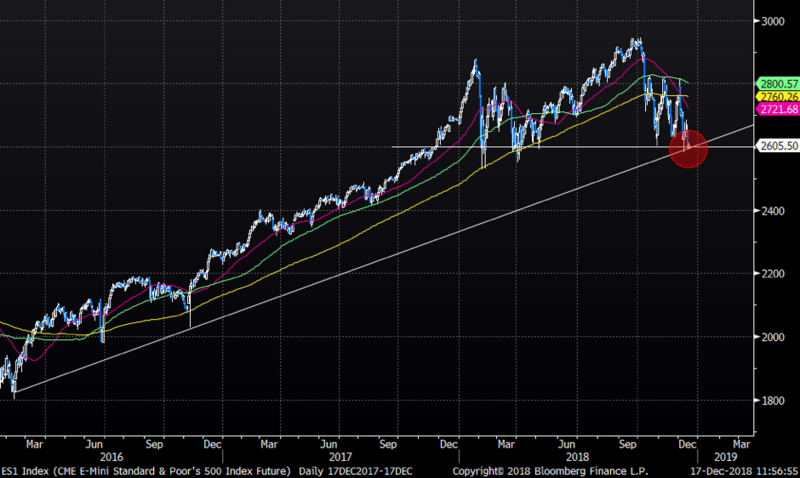 Note, there is a longer-term trend line right at those levels. NASDAQ is basically within 1% from where the index closed on the first day of this year. Much ado about nothing, but oh boy how brutal has recent volatility been towards the crowded longs. 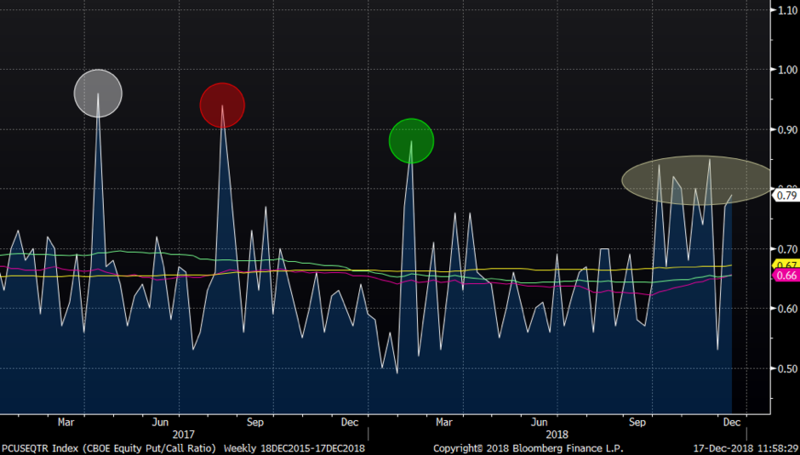 Put call ratio has spiked several times over past 2 years, but interesting to note is how previous spikes have quickly reversed lower as markets have bounced higher. This time around we have had several bounces, but index keeps coming back to the big support levels, resulting in investors loading up on puts relative to calls. A similar observation is to be made when it comes to the VIX curve. Below is the 1 vs 6 months VIX futures. 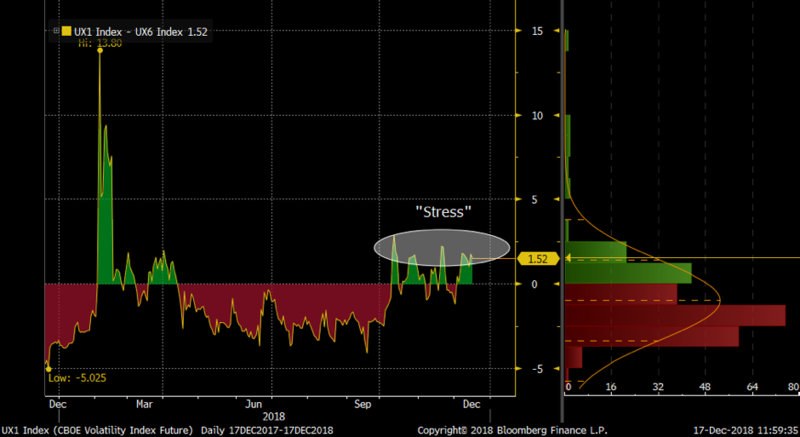 The spread remains trading in positive territory and is showing “stress”. Is this indicating a last shake out, a break down lower or an imminent bounce?